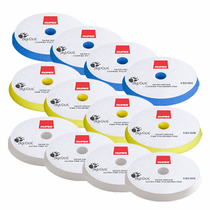 RUPES BigFoot 6.5" Gear Driven Mille Foam Polishing Pads in this money saving bulk pack of one dozen pads gives you the choice for each pad so you have just the pads you need on hand for your RUPES BigFoot Mile Gear Driven DA Polisher. RUPES BigFoot Coarse, Fine and Ultra Fine 6.5" Gear Driven Mille Foam Polishing Pads have been engineered specifically for the clockwise rotation distinctive gear-driven movement of the RUPES BigFoot Mille LK 900E Gear Driven DA Polisher, improving both stability and control while also reducing pad distortion. The low profile tapered design will help minimize the edges connecting with the adjacent surfaces during your polishing process, especially in tight areas and on curves. 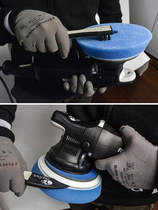 RUPES BigFoot Blue 6 1/2� Coarse Gear Driven Mille Foam Polishing Pad is firm enough to remove serious defects such as scratches and up to P1500 sanding marks in most paint finish types. The large open cell structure of the RUPES BigFoot Coarse Gear Driven Mille Foam Polishing Pad creates cooler temperatures for less drag on the surface during polishing. 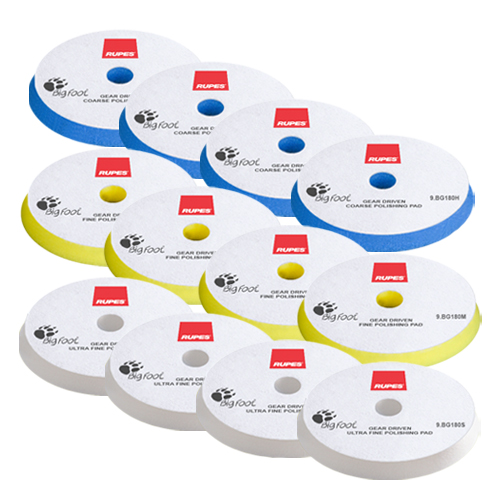 RUPES BigFoot Yellow 6 1/2� Fine Gear Driven Mille Foam Polishing Pad will remove light to moderate paint defects as well as enhance gloss and shine. The fine cell structure of the RUPES BigFoot Fine Gear Driven Mille Foam Polishing delivers consistent results throughout your polishing process. RUPES BigFoot White 6 1/2� Ultra Fine Gear Driven Mille Foam Polishing Pad allows you to achieve perfection and unbeatable high gloss shine. The is ultra-soft foam cell structure is soft yet firm to make the RUPES BigFoot Ultra Fine Gear Driven Mille Foam Polishing Pad perfect for you final polishing process for an incredible depth in shine. Cleaning of RUPES BigFoot Gear Driven Mille Foam Polishing Pad during use should be done with RUPES Claw Pad Removal & Cleaning Tool, to dislodge dried buildup of RUPES Polishing Compounds. Wash RUPES BigFoot Mille Gear Driven Foam Polishing Pads after use with a mild soap and water mixture by hand or in a washing machine without any fabric softener. 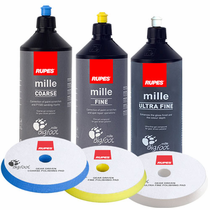 RUPES BigFoot Mille Gear Driven Foam Polishing Pads should be air dried or by machine only on a delicate cycle with low or no heat. Dryer sheets should never be used.